Adiss Harmandyan was from Armenia. There are not that many records from Armenian other than the traditional classical and / or folk music. This is mainly due to the fact that Armenia was part of the Soviet Union until 1991. And what little pop music that was recorded there was recorded in Russian. 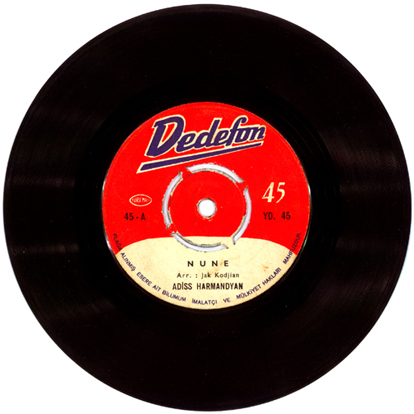 Armenia had a strong influence on the Ethiopian music scene. Most of the state sanctioned bands were comprised of Armenian refugees who had been invited by Emperor Haile Selassie during the Armenian Genocide. But many others left soon after, and setteled in other countries. I have not been able to find much information about Adiss Harmandyan, except that he apparently owns a pastry shop in Los Angeles, California and occasionally performs weddings and Armenian cultural festivals around the U.S. and Canada. Catalog number YD. 45 on Dedefon of Turkey. No other information available.